Naturals Extracts with Amino acids, Multivitamin and Minerals Tablets is a synergistic combination of essential components which not only support the structure and function of hairs, skin and nails but also improve the immunity of the individual promoting efficient and long lasting health. 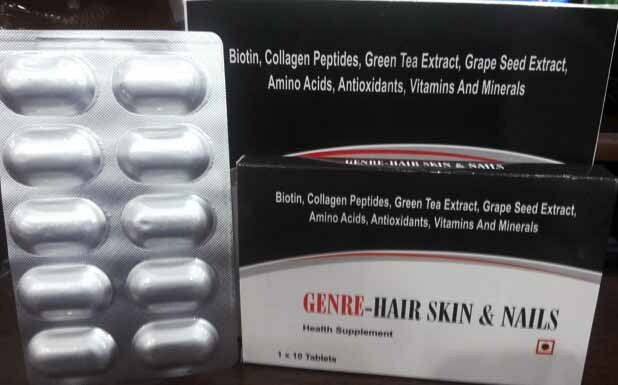 Each Tablet contains Collagen Peptide (TYPE I), Grape seed extract and Green tea extract along with amino acids, multivitamins and minerals which acts as Synergistic herbal complex with Powerful anti-oxidant properties accompanied by replenishing properties for hairs, skin and nails. Natural Extract: Collagen peptide (type I), Grape seed extract, Green Tea Extract (Eq. to 90% polyphenols). Amino Acids: L-Methionine, L- Cysteine and L- Lysine. Vitamins: Calcium Pantothenate, Nicotinamide, Vitamin C, Biotin, Choline Bitartrate, Inositol, Folic Acid and Vitamin B6. Minerals: Zinc, Iron, Copper, Silica and Selenium. ● Prevent skin aging by making skin more supple and improves hair and skin quality. ● Maintains liver function and blood flow and fluid balance. No one wants to deal with hair loss, skin and nail problems but it is something that happens to millions of people around the world. It is important to be sure that we are eating all the right foods for our overall health, and the things we eat can play a huge role in the health of our hair. Both men and women need to have plenty of certain vitamins and nutrients in their diets to avoid such problems, and these can be found in many foods and in dietary supplements. Therefore a combination of natural ingredients (natural extract, amino acid, minerals with vitamins) which not only prevents these problems but help rejenuvate the immunity and add to the overall health of the individual has been formulated. There are no side effecrs associated with the formulation since all the ingredients used in this formulation are Generally recognized as safe for all population groups. However Pregnant and lactating mothers should not take any single vitamin or mineral supplements in higher-than-normal doses unless recommended by a health-care provider for a special condition. Also, caution should be exercised that higher-than-normal doses of the fat- soluble vitamins can be toxic. Thereby, Although safe this product should only be taken after consulting your physician or gynaecologist in the recommended dose only. Store in cool and dry place. Protected from direct sunlight.